Want the skinny on what pharma should be doing social media-wise? Then join veteran communicator and digital strategist, Jenni Beattie at the 2012 Digital Pharma Seminar this Wednesday morning, August 8 to learn why and how pharma should be jumping on the digital bandwagon. “I plan to eliminate some of the confusion regarding social media; outline the current context and explain why pharma should be operating in the social media space. I will also highlight what is considered good and bad social media practice,” said Ms Beattie. Social media presents pharma with an opportunity to interact and engage with target audiences. However precautionary measures must be taken, warns Ms Beattie. “The decision to employ social media strategies should be based on thorough research and commitment, rather than a false need to follow digital trends. “It’s about fishing where the fish are. Taking the conversation and information to a relevant place that’s convenient for healthcare professionals and patients, and is easily accessible,” Ms Beattie said. However pharma companies must be ready for the cultural shift, and understand the complexities and risks of social media, particularly given the spotlight that the industry currently occupies, according to Ms Beattie. “Proper guidance and governance is vital to avoid mismanagement. Remember the Holy Trinity – monitoring, policy and practice. “The challenge is to maintain positive, quality interactions,” said Ms Beattie. If you and/ or your company is grappling with how to integrate social media into your communication model, then this presentation is a must-see. 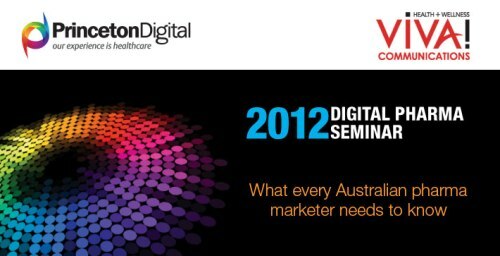 Registrations are still open for the 2012 Digital Pharma Seminar. Jennie Beattie will present from 10-10.30am. Posted in Health PR, Recent Post, Social Media + Pharma and tagged digipharm, digitalpharma, Jenni Beattie, pharmaceuticals, social media, VIVA!